In addition to the product design we have put in a lot of thought and effort in designing tags , envelopes etc to enhance the eco quotient of every aspect of Clean Planet . e.g the papers used for the tags are 100% wood free , hand made papers . The main tag has been designed to be used as a book mark. We’ve always felt that it’s such a waste for packaging to be discarded after a single use . At our office we reuse packaging material extensively . - The packing is over done or done in a way that makes reuse impossible e.g we see online stores that will pack even a book in shrink wrap , followed by bubble wrap and then in a carton like paper package with liberal use of tape . To get to the product you’d need to literally rip apart the packaging . Sure , the product is intact . But the planet pays a high price for every package shipped. Every product produced requires resources – material , energy , man power , fuel . It’s not planet worthy to make single use products if the product can be designed to be multi-functional . In India recycling is currently done at a very limited scale . All the stuff we toss in the garbage is transported to a land fill. Lack of segregation means that even bio-degradable stuff languishes in a land fill next to non-biodegradable material. 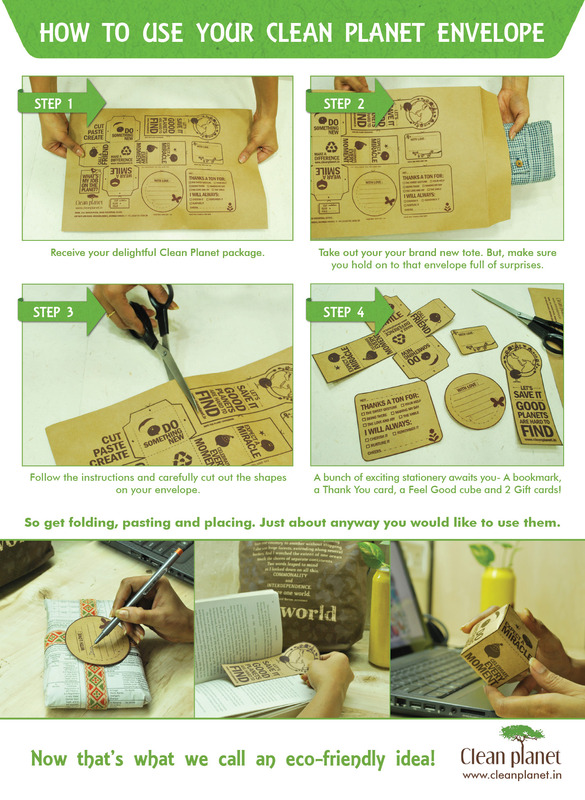 We worked on making the envelope used for sending out the orders super versatile . One side of the envelope is printed with material that customers can cut out and use in a variety of ways . The envelope is more than an envelope . It’s takes on a new life as cards / book mark / positivity dice – spreading joy and love on the planet . The Clean Planet envelope was recently featured in ‘Packaging Of The World‘ that showcases creative packaging from across the globe. p.s – a huge Thank You to all you awesome folks who have been buying Clean Planet products and re-using the envelope to make this a happier planet ! At our office we reuse packaging a great deal . Cartons , polybags , envelopes are neatly opened to enable reuse. Any paper bags received are definitely reused. We recently made envelopes from magazine paper. Now we’re exploring Furoshiki inspired packing options for some materials that we send out to clients. Packaging of most products is a resource intensive activity . Paper , plastic is used liberally by manufacturers ,retailers. Most of which is discarded on receipt of the material. At every stage we can and must explore + implement ways to minimize packaging to serve the purpose of the product being transported from A to B in a safe , neat condition. Even so we can find ourselves with hillocks of packaging material. It makes no sense to toss away packaging received and buy fresh packaging material.Reuse. Reuse.Reuse. Recycle. Once is definitely not enough.